It's amazing what a difference a deadline makes. I've been puzzling over a build problem for several weeks now, without success. None of my boat building books has a solution. Even Clem Kuhlig's "Building the Skiff Cabin Boy" just skips over the problem. Here's the problem: The backbone of the skiff consists of the stem in the front, the keelson along the bottom, and the transom in the back. The stem has to go from about where my hand is in the picture below, down to the leading edge of the ladder frame. What makes this complicated is that the angle and position of the stem is very important, and I knew I'd have to fool around with it a bit to get it right. So how could I hold the stem in place in a way that was easily adjustable, but also very strong? The stem needs to go from where my hand is, down to the frame. As of yesterday, I had no idea how to do this. But once I gave myself a deadline, it suddenly came to me this morning. What I needed was something like a clothespin clamp. 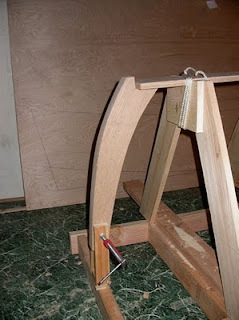 I built a custom clamp out of scrap wood so it would closely fit the stem, shown in the photo below. 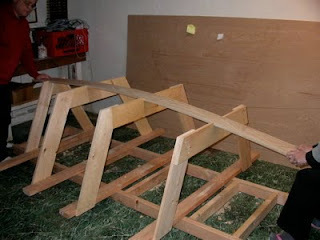 Then I screwed it to the leading edge of the ladder frame, right on the center line. This is important, because of course the stem needs to line up with the center line. Then I inserted the top of the stem into the clothespin jaws, and tightened up the whole system with a C clamp. Amazingly, I can now adjust the position and angle of the stem as much as I need to, and when I tighten the clamp, it is held firmly in place. I'm sure this micro-invention has been discovered by many builders, but I was pretty proud of myself, nevertheless. Once I finished the stem clamp, I cut the notch in the bottom of the stem that will accept both the keelson and the bottom plank. Then I reinstalled the stem and adjusted it until everything fit right. The keelson will be bolted to the stem using a long, countersunk bolt through the keelson and stem. And that was Day 19. Tomorrow, I must tackle the transom. I still have no idea how to clamp that in place, so if you have any ideas, please comment below or email them to john (at) unlikelyboatbuilder (dot) com. Positioning the transom will be easy *--IF--* you do not shape the top edge of the transom until much later in the build. Retaining the straight edge gives you something to pin down to the stongback. Cutting the curved top too early deprives you of this useful reference edge. 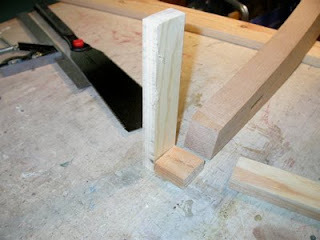 Retaining that edge, you have a flat surface to rest across a beam in the strongback. 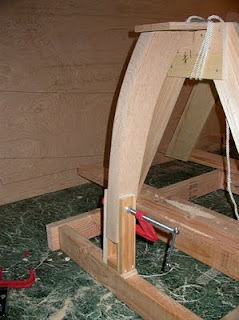 Hold in place with a couple of scrap blocks, similar to the "clothespin" uprights you made for the stem. I'm probably being thick... one problem is the transom is raked, so the simple up-and-down clothespin clamp isn't going to work. I was thinking of clamping from the side with clothespins that can swivel, and maybe even slide up and down in a slot... That seems overly complicated, though. 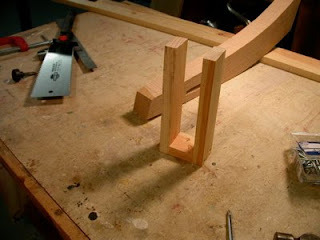 Greg Rossel's transom jig seems simpler, so I might try that. I should have been more specific. By scrp blocks, I intended small pieces of scrap that could be cut to the transom's angle and screwed to the strongback where needed. 4 small blocks would do it. All you need is to get the top edge anchored at the right distance along the stongback and the correct angle to the keelson. 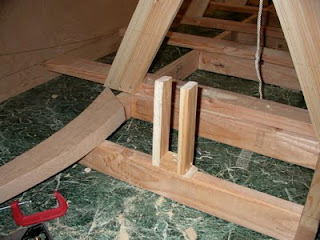 There's little need for a huge jig or angled fixture since there is little pressure along the lobgitudinal axis when adding planks. All you need is to keep the edge from moving along the strongback.